Belgian manufacturer AVR launched an anti-erosion ridging option for its Ceres potato planter at this week’s Interpom trade fair. Available for the coming season on all Ceres four-row potato planters, small rollers riding on top of each row move metal spading plates, or scoops, up and down between the ridges. This action leaves small mounds of soil in the bottom of each ridge preventing water and earth erosion on sloping land. Depth control is via mechanical spindles, and the pressure adjustable spring tine on each scoop not only exerts downwards pressure, but also allows it to retract and ride over a stone. The new ridging option is also compatible with the firm’s GE-Force cultivator. 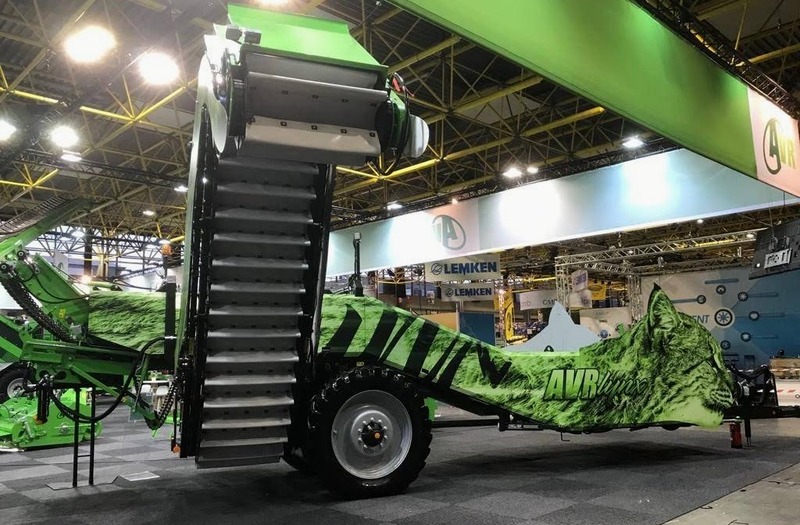 AVR also showed a wrapped version of the recently-launched trailed Lynx potato harvester, which was equipped with Varioweb cleaning module. The 333rd self-propelled Puma 3 with ACC (All Condition Control) harvesting blade was also on the stand. Held at the Kortrijk Xpo, with 300+ exhibitors, the roughly 20,000 visitors that attended this year’s edition of the Belgian show came from nearly 50 different countries.